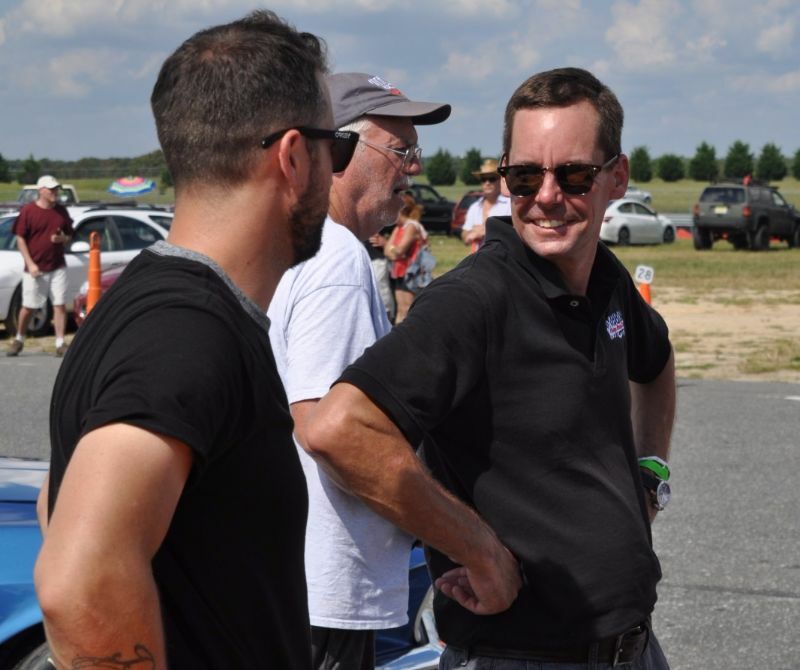 VRS with VRG at New Jersey Motorsports Park — Automotive Restorations, Inc. It was a Podium-finish fest with Alex, Dave, Jim, Kent & Marc all finding 1st overall & top three finishes on several occasions this weekend. Most of the cars you see here took their drivers right to the front, and a great time was had by all under clear skies. Plenty of practice time and three races per group with not a single DNF all weekend is a flavor we can all savor… and we did, drivers and crew alike. VRS Spitfires Ruled: These loud little 1300s ran at the front of group 1 all weekend with Dave Gussack (blue/white car) taking the most wins and being smart about ear-saving plugs ….. above! 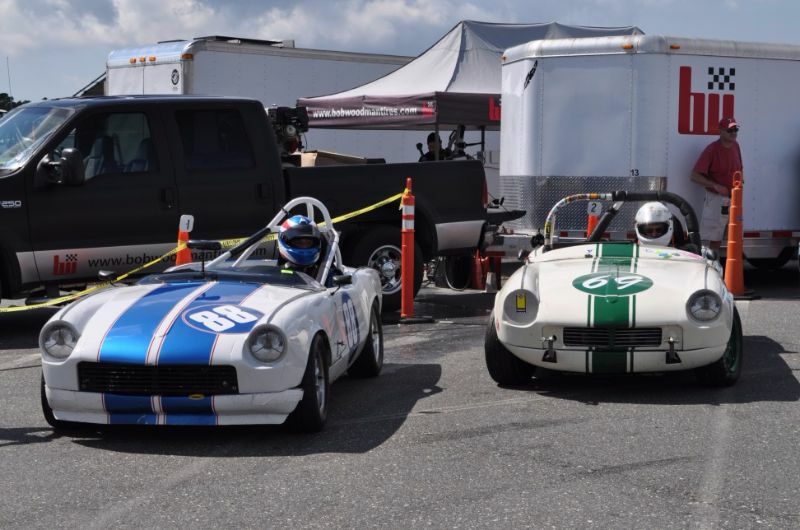 ALEX HECKERT AND HIS VERY QUICK ‘66 CORVETTE WERE ON TRACK AND IN THE TOP 3 ALL WEEKEND WITH AN OVERALL WIN IN THE FINAL RACE ON SUNDAY – WELL DONE ALEX!! JIM LENEHAN AND HIS TRUSTY VRS-PREPARED SWIFT WERE INDEED SWIFT RUNNING AT THE FRONT FOR MOST OF THE GROUP 2 RACES THOUGH MARC SHARINN DID MANAGE TO CATCH HIM ON OCCASION. MARC SHARINN USED HIS NEW CARBIR TO GOOD EFFECT. 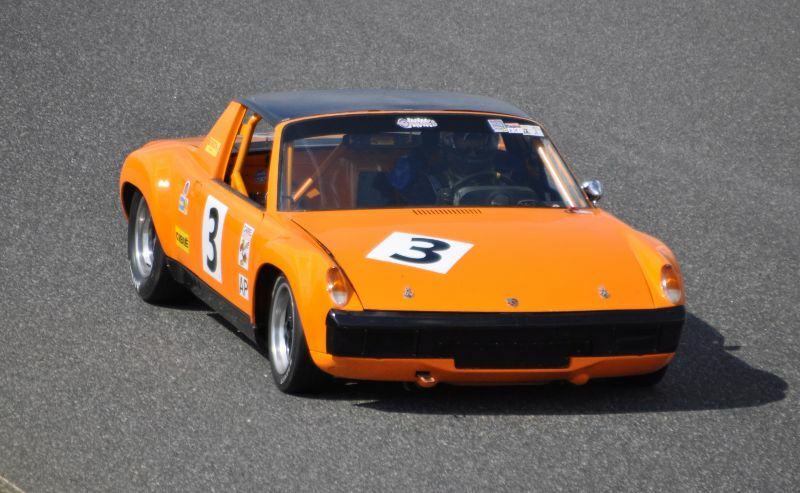 HE TOOK HIS TIME LEARNING THE CAR AND TRACK THEN PUT HIMSELF AT THE TOP OF THE PODIUM TWICE: A FIRST OVERALL IN GROUP 2 SATURDAY AFTERNOON AND SUNDAY RACES. IS THERE A BETTER WAY TO BREAK IN A NEW RACING APPLIANCE? WELL DONE, MARC!! BOB MITTMAN MARKED THE 3RD ROUND OF HIS 2017 RETURN TO RACING WITH CONSISTENT QUICKNESS AND GOOD HIGH SPEED JUDGEMENTS APLENTY. 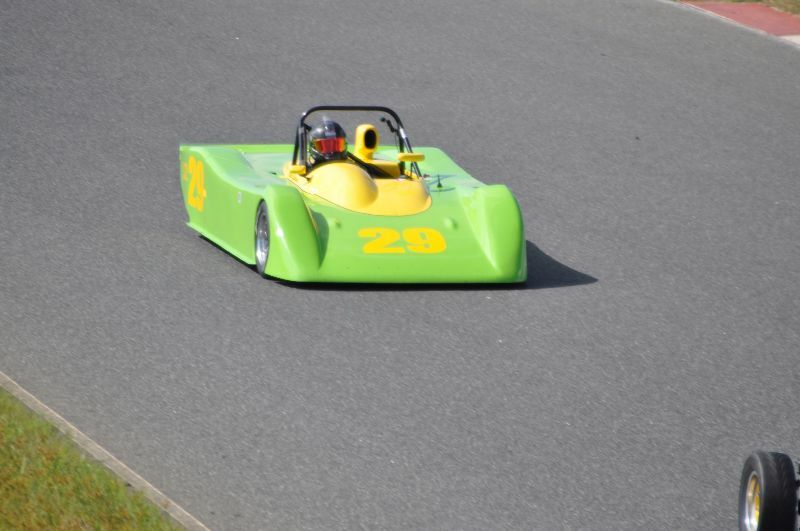 EXPERIENCE ILLUSTRATED AS CARBIR S2000 AND BOB DID NOT PUT A WHEEL WRONG ALL WEEEKEND…. Until…??? Among the fastest lawn mowers known to man we find the Carbir S2000. Left: Bob proudly surveys the result of his grass cutters regatta necessitated by some errant on-track oil slick. We’re told the cut was both close and fine! Gregg had just the right tool for cleanup; taking his leaf blower along was indeed a stroke of genius! 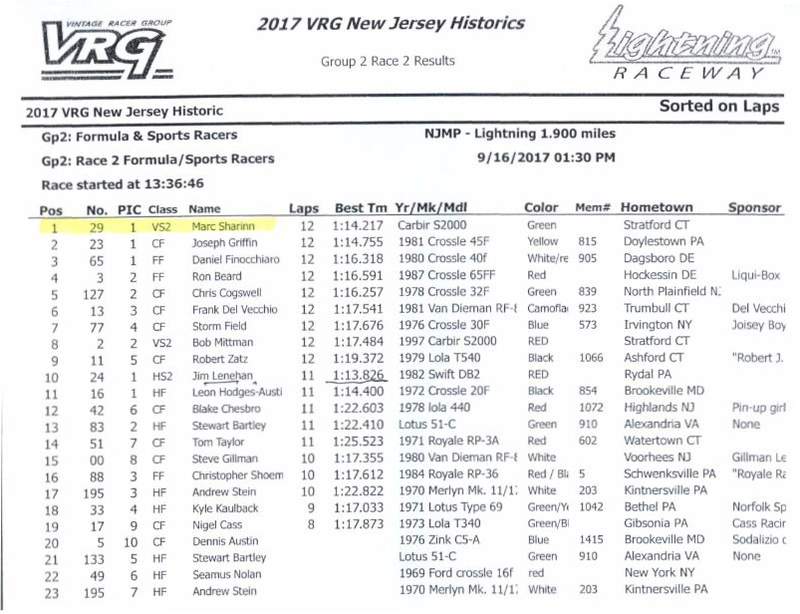 As we said at the onset: VRS with VRG at NJMS was “Podium-Finish Festival” for the VRS racers as the results attest. The drivers were the key and we techs are all delighted to see our guys go so well!! THE FINALE !!! Sunday race day found VRS racers on the podium for 3 of the 7 race groups VRG’s NJMS program offered. 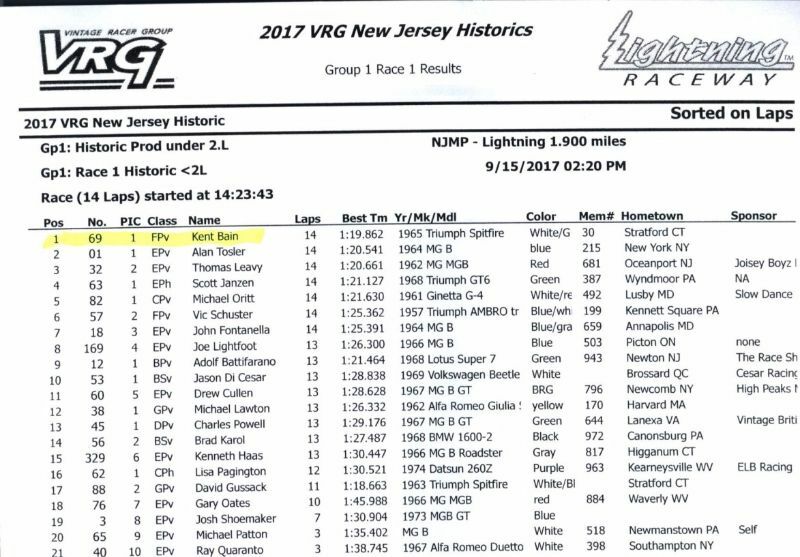 A VRS Spitfire took 2nd in group 1 with yours truly at the wheel. Marc won the Group 2 race with Jim a very close 2nd and Alex drove his ‘66 Vet to a 1ST overall in the big bore group 3 race. Well done all and better yet: we all had a great time! Thanks to the Vintage Racer Group for making it all happen…seamlessly! And we all enjoyed the weekend for a change!! No, that lyric’s not right, we all almost always enjoy our race weekends. Happy racers, technicians we were ….. but multi-tasking technician and rig driver Keron, right, is looking a little worried about all the Jersey Turnpike traffic he’s about to row the Kenworth thru! !